February was officially established as National Pet Dental Health Month in 1993 by the AVDS, the American Veterinary Dental College and the Academy of Veterinary Dentistry. 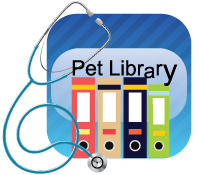 Your pet is then handled by our technicians who obtain pre-anesthetic bloodwork (mandatory for animals over 7). This gives the veterinarian an idea of your animal's liver and kidney function, screens for other blood disorders and gives us an idea of how well your animal will metabolize the anesthesia and how fast it will be removed from the body. Once your animal has been cleared for surgery, he/she is given an intravenous (in the vein) injection of anesthetic, and drifts off to sleep. A tube is placed in the trachea to assist with breathing, and the plane of anesthesia is maintained via gas through that same tube. The animal is observed at all times by a technician, and machines measure pulse and respirations. The supragingival (above the gumline) plaque and tartar are removed using special calculus forceps, hand instruments, and power scaling equipment. We examine individual teeth for mobility, fractures, malocclusion, and periodontal disease (probe for pocket depths after calculus is removed). Special curettes are used to probe the subgingival (below the gumline)spaces as well as remove any deposits. Regardless of how careful we are during the scaling/curettage phase of teeth cleaning, minor defects of the tooth surface occur. Polishing smoothes out the defects and removes plaque missed during previous steps. Pumice or polishing paste is used on a polishing cup for the procedure. Any excess paste or debris is flushed away when the teeth are rinsed. We then apply OraVet, a barrier sealant that helps to protect teeth and gums from plaque and calculus buildup due to bacteria. After the cleaning, you will begin the weekly at-home applications of OraVet Plaque Prevention Gel to your pet's teeth and gum line. These weekly applications help maintain the protective barrier your veterinarian established, and take less than 60 seconds. Just spread the gel along your pet's gum line using the applicator supplied. The pet owner is an integral part of our dental team. Home care is the single most important procedure the owner can do to maintain oral health. If performed regularly, daily brushing or the use of OraVet Gel will dramatically increase the interval between teeth cleaning appointments. Plaque is constantly being made and deposited in the mouth. Humans have a buildup of plaque in the morning, that makes our breath smell bad. Proper home care can keep plaque buildup under control. The goal of dental home care is to remove plaque from tooth surfaces and gingival sulci before it mineralizes into calculus, a process that occurs within days of a teeth cleaning. Success depends on the owner's ability to daily brush the teeth or the use of OraVet Gel, as well as the dog or cat's acceptance of the process. Clients often ask, "doesn't hard food keep teeth clean?" Some believe when their dog or cat chews on hard food or biscuits, mineral deposits are broken down and the teeth stay clean. This is not true. True, animals on soft diets accumulate plaque more readily than those on dry foods, but the only way to keep teeth clean above and below the gum line is by routine care.